Animals love to find ways to make your fence their new home – especially bee’s (yikes!). Every spring and summer, make sure to visually inspect your fence and make sure you do not see any holes. Even small holes in your fence could mean a big nest. You’ll want to take the necessary steps to safely rid the animals of your fence. One of the most important things you can do to keep your fence looking brand new is to stain/paint it. 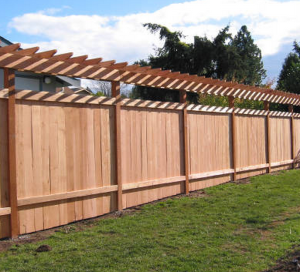 Staining your fence provides more protection because a stain actually goes farther into the fence, whereas paint stays only on the top layer. By staining your fence you will not have to deal with chipped paint either. Often times a fence can break due to harsh weather (especially here in New Jersey where we get some pretty big hurricanes). If your fence breaks, don’t worry. Here at Anello Fence, we have all the necessary materials to fix your broken fence. Give us a call and we’ll be over to make it look brand new again! Mold can really do a number on your fence. That’s why we recommend investing is a power washer to easily clean off any mold and debris to keep your fence looking great. There you have it, the top four ways to keep your fence maintained. Have a question or comment? Drop us a line by contacting us here.